FROM INGENIUOUS INDIES TO BLOCKBUSTER BROMANCES, PAUL RUDD IS SUDDENLY ON THE MOVIE INDUSTRY’S SPEED DIAL. IT COULDN’T HAVE HAPPENED TO A NICER DUDE. Rudd and I are sitting on an elliptical bench in a park in the heart of New York City’s Chinatown, with a gallon tub of pickles between us. It’s a hot summer morning—the stone is still cool—and, not too far away, some people are playing unusual, unfamiliar instruments that look a little like lutes, and a little like clarinets, but aren’t quite either; beside them is an old man doing Tai Chi, his slow, precise movements at odds with the soft, discordant jangle coming from the ragtag band. A few hours ago, we met at the Tenement Museum on the Lower East Side and bought tickets to take a tour. As the next one wasn’t for 45 minutes, we decided to go for a walk, and never went back. Instead, we searched for pickles. “This is the pickle capital of New York,” Rudd assured me more than once as he strode confidently around the neighborhood, eyes scouring shop awnings. “There was a time that the whole area was covered with pickle shops. There must be one around here somewhere.” Alas, a thorough investigation of Ludlow, Eldridge, Allen, and Orchard streets proved pickleless. As we were about to give up, we came across The Pickle Guys, a sliver of a store on Essex packed with barrels brimming with the things. “Doesn’t look like it. How do you tell?” I ask. He holds it up to his face, examining it as though he’s a biologist and the pickle is a rare caterpillar. “Hmm. No idea.” Rudd takes a confident bite, then screws his face up. If you’ve seen anything Paul Rudd has ever been in (and it’s hard to imagine how you might have avoided him for this long) you probably have certain preconceptions about the guy. Invariably, he plays likeable, charming, funny characters doing things we can relate to with people a lot like our own friends, dating girls a lot like the ones we’ve all dated at some point. Even as he’s stepped out of supporting roles and taken leads in films like Role Models, Dinner For Schmucks, I Love You, Man and now, Our Idiot Brother, he’s maintained that approachable affability, shot through with a whip-like comic timing, and an innate knowledge of the power of the one-liner. As Jason Segel, his co-star in I Love You, Man and Knocked Up, puts it: “Rudd has really perfected being the everyman. You feel like you know him, and he’s your buddy. You never feel like he’s pushing too hard with his comedy. It’s always pitch-perfect. He’s a leading man with the mentality of a comedian.” It worked for him when he played Mike Hannigan, Phoebe’s husband in Friends, Andy in Wet Hot American Summer (“You taste like a burger, I don’t like you anymore”), Brian Fantana in Anchorman (“60 percent of the time, it works every time”), and throughout his tenure with Judd Apatow’s clique, first in Anchorman, then Knocked Up and Forgetting Sarah Marshall. It will doubtlessly work, too, in the as-yet-untitled “spin-off” to Knocked Up, which Apatow is writing and directing, and which will focus on Rudd and Leslie Mann’s characters. And it’s working right now, on this bench. 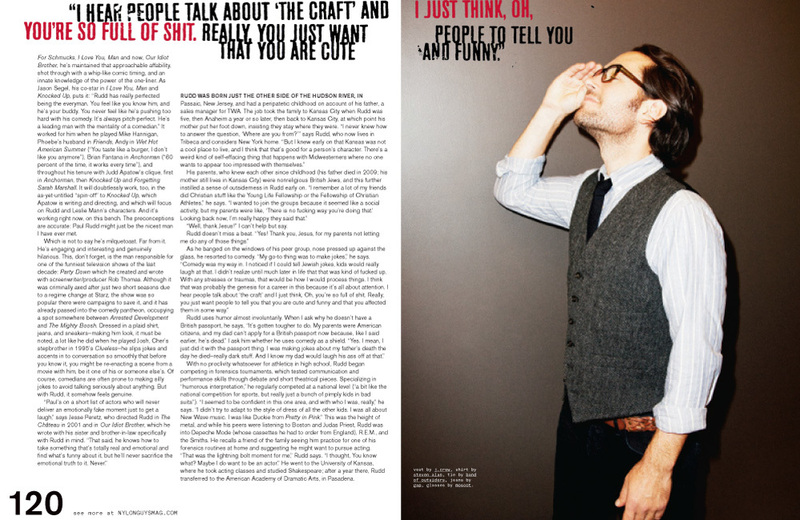 The preconceptions are accurate: Paul Rudd might just be the nicest man I have ever met. Which is not to say he’s milquetoast. Far from it. He’s engaging and interesting and genuinely hilarious. This, don’t forget, is the man responsible for one of the funniest television shows of the last decade: Party Down which he created and wrote with screenwriter/producer Rob Thomas. Although it was criminally axed after just two short seasons due to a regime change at Starz, the show was so popular there were campaigns to save it, and it has already passed into the comedy pantheon, occupying a spot somewhere between Arrested Development and The Mighty Boosh. Dressed in a plaid shirt, jeans, and sneakers—making him look, it must be noted, a lot like he did when he played Josh, Cher’s stepbrother in 1995’s Clueless—he slips jokes and accents in to conversation so smoothly that before you know it, you might be re-enacting a scene from a movie with him, be it one of his or someone else’s. Of course, comedians are often prone to making silly jokes to avoid talking seriously about anything. But with Rudd, it somehow feels genuine. “Well, thank Jesus!” I can’t help but say. With no proclivity whatsoever for athletics in high school, Rudd began competing in forensics tournaments, which tested communication and performance skills through debate and short theatrical pieces. Specializing in “humorous interpretation,” he regularly competed at a national level (“a bit like the national competition for sports, but really just a bunch of pimply kids in bad suits”). “I seemed to be confident in this one area, and with who I was, really,” he says. “I didn’t try to adapt to the style of dress of all the other kids. I was all about New Wave music. I was like Duckie from Pretty in Pink.” This was the height of metal, and while his peers were listening to Boston and Judas Priest, Rudd was into Depeche Mode (whose cassettes he had to order from England), R.E.M., and the Smiths. He recalls a friend of the family seeing him practice for one of his forensics routines at home and suggesting he might want to pursue acting. “That was the lightning bolt moment for me,” Rudd says. “I thought, You know what? Maybe I do want to be an actor.” He went to the University of Kansas, where he took acting classes and studied Shakespeare; after a year there, Rudd transferred to the American Academy of Dramatic Arts, in Pasadena. RUDD DIDN’T GET THE TRIVIAL PURSUIT GIRL (COINCIDENTALLY, SHE WOULD go on to be an actor, too—her name is Sarah Clarke and she’s in the Twilight movies), but over time he became good friends with Hamm, who, after a stint as a teacher, decided to try his luck at being an actor, and moved to California and into Rudd’s spare room. By this point Rudd had graduated from the AADA and was keeping afloat with commercials and small roles in TV shows while maintaining a second job as a DJ on the side. “I’d be doing bar mitzvahs, bat mitzvahs, weddings...” he says, grinning. “I’d play M.C. Hammer, Right Said Fred.... I was like The Wedding Singer.” Roles were coming in, including a recurring part on Sisters, but they weren’t what Rudd was interested in. “I was 23 and hitting the full-on precious years,” he says, then raises his voice, assuming the gravitas of a head teacher at an assembly: “I want to learn! I want to do theater! I want to do something important! Really good stuff, not just crap! I’m a Shakespearian-trained actor, for God’s sake!” So he did what probably no 23-year-old actor in Hollywood has ever done: Packed up his things and went to Oxford, England, to study classical Jacobean theater at the British- American Drama Academy. there are some great fart jokes in Jacobean literature.” He pauses, studying the pickles, and points at one. “This has to be the sour one, right? I’ve been looking for that one all morning.” He bites off a chunk, smiling a satisfied smile through chews. When he had completed the course in Oxford, Rudd went back to Hollywood, and landed the role in Clueless. The film was a hit and Rudd suddenly found himself in front of directors on first auditions; the doors of Hollywood were opening to him, momentum was building, this—he was told—was his moment. “But I wanted to have a long-term career, not just in the immediate,” he says. “I had to really know what I was doing and get experience. 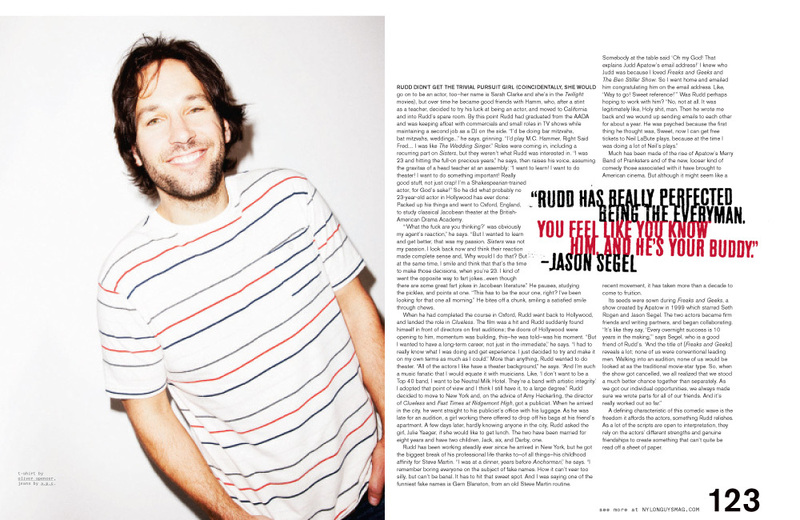 I just decided to try and make it on my own terms as much as I could.” More than anything, Rudd wanted to do theater. “All of the actors I like have a theater background,” he says. “And I’m such a music fanatic that I would equate it with musicians. Like, ‘I don’t want to be a Top 40 band, I want to be Neutral Milk Hotel. They’re a band with artistic integrity.’ I adopted that point of view and I think I still have it, to a large degree.” Rudd decided to move to New York and, on the advice of Amy Heckerling, the director of Clueless and Fast Times at Ridgemont High, got a publicist. When he arrived in the city, he went straight to his publicist’s office with his luggage. As he was late for an audition, a girl working there offered to drop off his bags at his friend’s apartment. A few days later, hardly knowing anyone in the city, Rudd asked the girl, Julie Yaeger, if she would like to get lunch. The two have been married for eight years and have two children, Jack, six, and Darby, one. A defining characteristic of this comedic wave is the freedom it affords the actors, something Rudd relishes. As a lot of the scripts are open to interpretation, they rely on the actors’ different strengths and genuine friendships to create something that can’t quite be read off a sheet of paper. You could interview hundreds of actors and not witness this kind of raw honesty. And, as Rudd gets himself together and we discuss his father’s love of history and ephemera (Rudd once bought him F.A.O. Schwartz’s actual invitation to the offical opening of the Brooklyn Bridge), it occurs to me that while he certainly deserves his reputation as “nice,” it is far from his most important quality. Rudd is real: it is the quality that informs his best work, and something he has managed, against all odds, to keep intact throughout two decades in an industry seemingly purpose-built to destroy it. Does he have any regrets?